As a follow-up to a post by SDR from last fall regarding the Whitford Haddock House in Ann Arbor (which is noted by Mark Hertzberg in his Wright in Racine book), I came across some photos earlier today which I'll post momentarily. Mark Hertzberg has it covered in his Wright in Racine. Google is a great boon . . .
Monograph 6 has the plan, and an elevation with indication of re-thinking of the roof pitch. Before the Kitchen Remodel. Post-remodel photos can be found via the link above. Couldn't resize without it being cut-off. Coming from a very cold climate, I have always loved the design of Below Zero, which appeared both cozy and expansive ... but wonder what changes were made to the plan before construction ... as it would be fairly unlikely the new client would want a darkroom. With only one bedroom, some accommodation to new circumstances would seem almost inevitable. Does anyone have a plan of the house as constructed? Whitford Haddock House in Ann Arbor is one of the least known Wright houses. I have not seen it published in any book, although I have not looked thru the latest three volume set by Pfeiffer. It is totally unlike anything that was built in that era. It is currently in very good condition and is owned by the ex-wife of the original client. We visited this house fall of 2013. 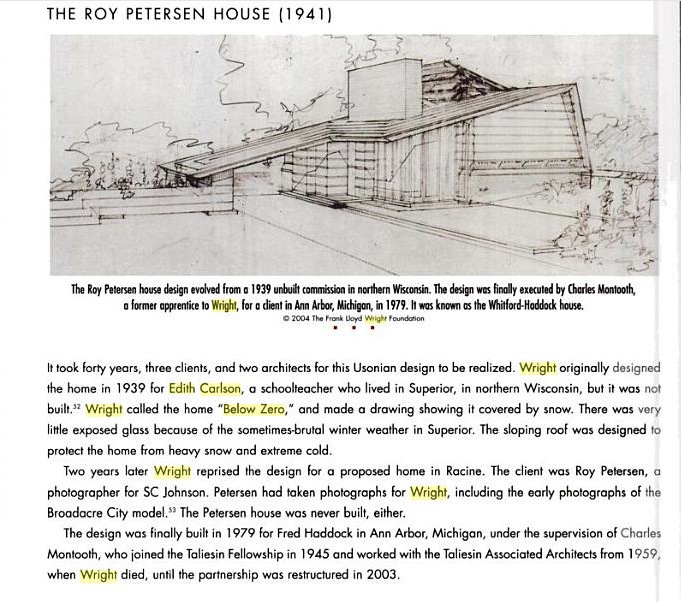 Taschen (Pfeiffer) apparently does not present projects constructed after Wright's death. could easily have used flat-panel cabinet doors rather than the Shaker style ones in the photos ? Agreed. The original kitchen looks great in the photos. Maybe a cleaning crew was all that would have been neccessary. The new cabinets are by no means an improvment. does anyone know the address? 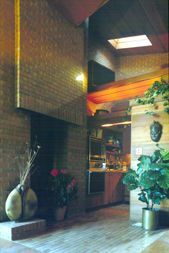 Interesting that Heinz does not include this house in his book FLW Field Guide, but he does include other Legacy houses. thanks - I'll try to venture out in the snow to see it. Winter isn't fun, but it allows some views of houses that are otherwise obstructed by trees (like Palmer in Ann Arbor). 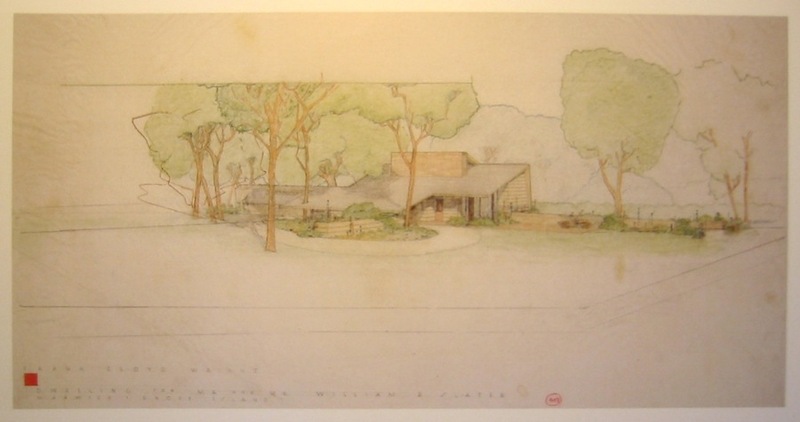 Rood, the Roy Peterson House is one of three versions of this plan, the others being Carlson and Slater, in which sleeping accommodations were expanded as needed. jmcnally, if you Google the address, you will see you would have to tresspass to see the house. It appears there is an easment of some length from Holden to the house, which is shielded on the north by a coppice of pine. 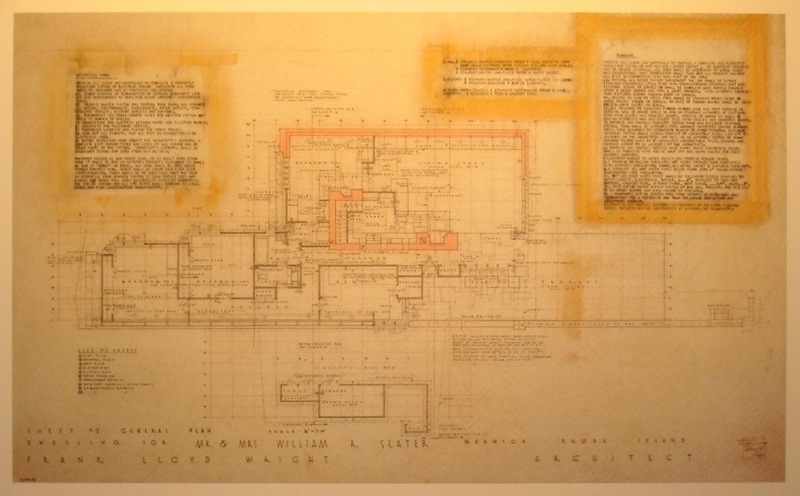 Notice the unusual placement of the perforated panels, shown on the drawings as well as the completed house.. I'll check it out, but I won't trespass. I have family in that area (but not that neighborhood) so no trip will be wasted. The Roy Petersen plan presents a very unusual condition: the sole bathroom is accessible only from a bedroom. might have been especially pleased to realize one of them, at last. As for the perf strip location, I am reminded of the FSC Faculty House, recently completed . . .